Village Cinemas offers all Financial CFMEU Members an exclusive RDO discount: $10 standard movie tickets at Victorian Village Cinema locations. Available only for sessions before 5pm on official CFMEU RDOs (click here for calendar). * To claim this offer, the CFMEU member must present a valid CFMEU membership card in cinema to purchase tickets. 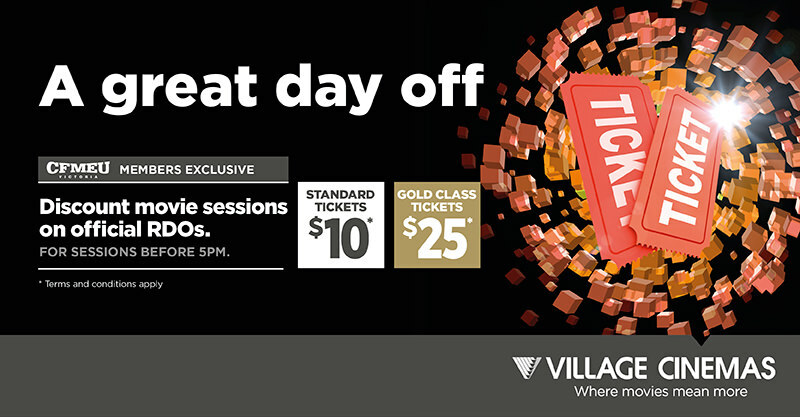 This offer is valid at Village Cinemas locations only for sessions commencing prior to 5pm for CFMEU recognised RDO’s. Limit of 5 tickets per session per day. Surcharges apply for Vmax, Vpremium, Vjunior, Dolby Atmos and 3D sessions. 3D glasses (if required) are available to purchase from the cinema location. Offer excludes Special Events, Movie Marathons, group bookings and is not valid in conjunction with any other offer or promotion unless stated. This offer may only be purchased in cinema. Offer expires June 30, 2018.